Post-it® Super Sticky full adhesive notes in 76.2 x 76.2mm size gives you peace of mind with better organisation. A World of Colour Cape Town Collection portrays a vibrant palette that's true to this port at the Southern tip of Africa. There's a lot of talk about how handwriting is on its way out. With the ascendance of technology, beginning with the typewriter and extending all the way to smartphones, it’s not hard to see that we’re writing less than ever before. And it’s true that writing letters or long messages to each other may be a lost art, especially when it comes to communicating for business or over long distances. For that quick reminder or urgent business matter, Post-it® Notes are still very much relevant. 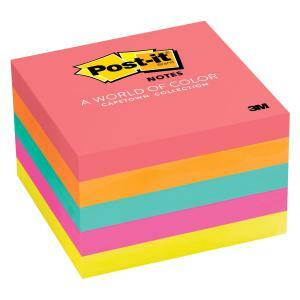 For ideas, comments, or reminders that need to stick in the workplace or at home, Post-it® Notes are the most preferred option. Strong enough to stick with you wherever you are. Make it stick with Post-it® Notes. Whether you’re working on a project, pursuing a goal or realising a dream, the creative buzz you get from transforming your ideas into realities is intoxicating. You relax into a rhythm, you get in the zone, and something new begins to take shape before your very eyes. The power of seeing an idea travel out of your imagination into the real world is proof that what we do changes the world around us. Let Post-it® Products help bring your new ventures from page to reality. Post-it® Products have helped shape the way organisations and businesses have generated ideas for the past 35 years—but many individuals have used these same products as a canvas to express their personal creativity. Whether you’re crafting an art piece, a literary masterpiece or just looking to organise your creative thoughts, here are some ideas to get you started. Organisation skills can do a lot for kids. When it comes to school, organisation is essential for keeping track of homework, projects and study schedules. But that means organisation itself can feel like something of a chore for many kids. That’s why it can be helpful to teach your kids organisation skills by starting with hobbies and extra-curricular activities. Learning to organise something they love can help kids internalise good habits that they can later apply to school, work and life in general. Help them stay on top of their education by teaching them life long skills with Post-it® Products.